Edgar Jones explores the making of an innovative film designed to show the treatment of soldiers suffering from shell shock. Shell shock, the iconic illness of the First World War, has found an enduring place in British culture. The most dramatic representation of shell shock comes from the film War Neuroses, made by Arthur Hurst in 1917–18 (tinyurl.com/pm3zxqo: see also Jones, 2012). His depiction of the disorder through bizarre or disturbing movement disorders is repeatedly shown in television documentaries. So established have these images become that it is difficult to conceive of shell shock in terms other than distressing gaits, facial spasm and uncontrollable tremor. Yet recent research of random samples of case notes and war pension files showed that these presentations were untypical of the disorder (Jones & Wessely, 2005). Shell shock was characterised by an inability to function, fatigue, bodily aches and pains, together with cognitive deficits, nightmares and difficulty sleeping. So what were Hurst’s motives in making the film and the treatment claims? In the aftermath of the battle of the Somme, shell shock became a medical emergency. The scale of psychiatric casualties was such that it threatened to undermine the fighting strength of the British Expeditionary Force. In 1916 the Medical Research Committee (MRC) offered grants to doctors to film the disorder to aid research and promote successful treatments. Doctors at the National Hospital in Queen’s Square and Hurst at the Royal Victoria Hospital in Netley secured funding. The illustrations in his textbook, War Neuroses and Shell Shock, suggest that Frederick Mott at the Maudsley neurological wing may also have commissioned a film of patients. Pathé cameramen, based at their Wardour Street Studios, were contracted to shoot the films, though the subject matter and editing remained in the hands of the clinicians. At first, Hurst followed the pre-war convention of medical film: patients or body parts depicted against a plain background. These sequences were used to illustrate his lectures at Guy’s Hospital. As his knowledge of the medium developed, Hurst included shots of soldiers before and after treatment to demonstrate the effectiveness of his interventions (Shephard, 2000). Inter-titles were used to provide patient histories and diagnostic terms, and most importantly to record the speed of cure. For example, Private Richards, shown with an abnormal gait at 2pm, was described as ‘cured’ by 3pm. Private Bradshaw who had suffered from functional paraplegia for 18 months, was ‘cured after a quarter of an hour’s suggestion and re-education’. Similarly, a ‘hysterical contracture of [the] hand persisting 35 months after [a] wound near elbow’ was apparently ‘cured after half an hour’s treatment’. In August 1918 Hurst and his deputy J.L.M. Symns declared in the Lancet, ‘we are now disappointed if complete recovery does not occur within 24 hours of commencing treatment, even in cases which have been in other hospitals for over a year’ (Hurst & Symns, 1918, p.140). When Hurst transferred his patients from the shell-shock wards at Netley to a newly built agricultural college at Seale Hayne, near Newton Abbot, not only did he have greater autonomy but also wider opportunities to demonstrate the effectiveness of his methods. Recovered soldiers were filmed undertaking occupational therapy: cultivating fields, picking fruit, looking after cattle and poultry, basket making and firing pottery in a kiln. Having been the director and producer of the film, Hurst shot a final sequence entitled ‘the Battle of Seale Hayne’, in which his patients paraded in battledress with weapons and took part in mock combat complete with smoke bombs and a stretcher party. What had begun as illustrative material for lectures ended as a mini movie designed to show the rehabilitation of shell-shocked servicemen. By autumn 1917, when Hurst began to experiment with the use of film, considerable research had been conducted into shell shock and its treatment. Two centres of excellence existed: the Maudsley led by Frederick Mott and Maghull Red Cross Military Hospital under R.G. Rows. Mott favoured a science-based approach, whereas Maghull doctors drew inspiration from anthropology and psychological texts. Each hospital had several years of accumulated expertise, and their doctors were agreed that chronic or severe cases invalided to the UK were difficult to treat. When Hurst published claims of dramatic cures supported by film appearing to show their complete recovery, experienced shell-shock doctors were taken aback. Hurst himself was a general physician with a pre-war interest in neurology and so was considered something of a newcomer to the field. How could he have achieved these remarkable results? Thomas Lumsden wrote to the Lancet in August 1918 to suggest that a follow-up study be undertaken at six months and a year to establish whether the cures really were permanent (Lumsden, 1918). Charles Myers, appointed by the War Office to oversee the management of psychiatric patients in UK military hospitals, was particularly concerned and visited Hurst at Seale Hayne. Myers thought that Hurst’s team of doctors lacked clinical understanding and recommended that Captain R.G. Gordon, a physician who had worked at Maghull, be transferred there to give weekly lectures on psychological medicine. So how was the film made? Recent study has shown that some of the before-and-after sequences involved re-enactment of symptoms (Jones, 2012). 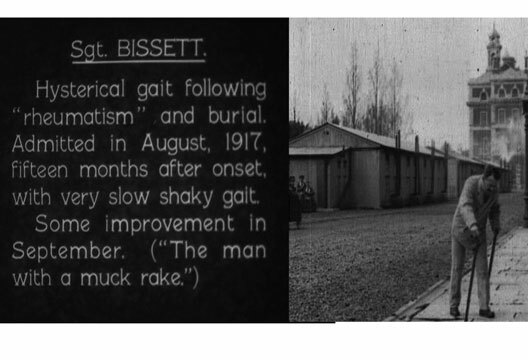 Sergeant Bissett, for example, was shown, according to the caption in September 1917, bent over, only able to hobble with the aid of two sticks. In the next scene, dated November 1917, he was shown walking almost normally. However, the background to both shots showed an identical group of nurses and column of smoke coming out of the chimneys of the distant huts. This demonstrates that both episodes were filmed at the same time: Bissett had been asked to re-enact his movement disorder for the camera. Hurst was consistently vague in his publications about treatments. A visit made by William London for the War Pensions Gazette in 1919 was no less illuminating. Apart from reporting the rapid cure of soldiers who were mute or paralysed, nothing specific was written about the nature of the treatment. Whilst the mystery can never be fully solved, there is telling evidence. The timing of the ‘cures’ in 1917–18 may explain why some cases of chronic invalidity improved or recovered. ‘The best tonic’, Mott observed, could be offered from late 1917 and was the assurance on admission that ‘under the new system of [medical] categories they cannot be found fit for service for six months, and probably that they [shell-shocked patients] will not be sent on general service again’ (Mott, 1918, p.128). However, the assurance that the invalided soldier was unlikely to return to front-line service was increasingly broken as manpower demands took precedence over individual soldiers’ well-being. As hospitalised servicemen increasingly doubted the promises made to them, the authorities surreptitiously introduced a further regulatory change in spring 1918. Captain T.A. Ross, who worked at Springfield War Hospital in Wandsworth, recalled the visit of a medical general to the shell-shock wards. The officer authorised Ross to discharge from the army as many functional nervous cases as he could, ‘though we must not say he said so’ (Ross, 1944, 169). By this time, the difficulty of returning chronic cases to full duty had been recognised and it was considered better to discharge them to productive employment and free their beds for the wounded. Interestingly, Ross’s account comes from a chapter in Hurst’s textbook, Medical Diseases of War. A likely explanation, therefore, is that Hurst was also offering to discharge soldiers if they said they felt better. Ross assured service patients that if they recovered ‘it was 100 to 1 that they would get out [of the army]. In marked contrast with previous cases, where I had not been able to say this, my arguments were grasped with ease and these patients soon got well’ (Ross, 1941, p.71). Writing an obituary for Ross, Hurst argued that a doctor had to convey a sense of conviction when proposing a treatment because, in the case of functional nervous disorders, ‘cures were the result of faith and hope’ (Hurst, 1941, p.463). War Neuroses exercised a lasting impact – not only on representations of shell shock, but also raising expectations about the outcomes of treatment. The film appeared to provide conclusive evidence that Hurst’s interventions worked. On the outbreak of the Second World War and the prospect of an epidemic of psychiatric casualties, some doctors suggested that the film be shown again to avoid the chronic invalidity of the First World War. However, Maurice Wright challenged the value of rapid methods arguing that they led to ‘very frequent relapses’ (Wright, 1939, p.615). This prompted Hurst to write to the British Medical Journal in September to defend his claims: ‘our psychotherapy consisted of simple explanation, persuasion and re-education, and it almost invariably resulted in the complete disappearance at a single sitting of the hysterical symptoms even when they had been present for a year or more’ (Hurst, 1939, 663). Dr John Tippet, who had worked as a psychotherapist at specialist units set up by the Ministry of Pensions immediately after the war, questioned the permanence of rapid cures for chronic patients: ‘I worked in four different “shell-shock” hospitals, and relapsed Seale Hayne patients were admitted to all of them, and were generally found to have no insight into their condition’ (Tippet, 1939, p.742). Persuasion and re-education were standard treatments practised throughout the UK, but Hurst never provided an explanation as to why he was successful where others failed. Furthermore, he made no mention of the film in his 1949 autobiography. As well as funding War Neuroses, in 1918 the MRC provided clerical assistance to explore the ‘after-histories’ of Hurst’s patients to establish how permanent the cures were. Whether this research was completed remains unclear, but the fact that no follow-up study was published fuelled the controversy surrounding the claims. After the war, Hurst returned to Guy’s Hospital where he built up a reputation as a gastroenterologist. Although a talented and charismatic physician, a long-time colleague, Arthur Douthwaite, observed one flaw in his personality: ‘his brilliant and versatile mind did not, however, include the power of critical appraisal of his sometimes hastily conceived theories’ (Douthwaite, 1971, p.314). Hurst had been precociously successful before the First World War and was aged 37 when put in charge of the neurology wards at Netley. Finding himself working on an important and high-profile disorder, his entrepreneurial flair was engaged, and once he had transferred to Seale Hayne there was no one to apply caution to his clinical ambition. However, Hurst may have learned a lesson from the shell-shock episode as the treatment programmes he offered for peptic ulcer during the Second World War had a more measured and achievable quality. Douthwaite, A.H. (1971). Selected writings of Sir Arthur Hurst. Medical History, 15(3), 314. Hurst, A.F. (1939). Treatment of psychological casualties during war. British Medical Journal, 2, 663. Hurst, A.F. (1941). Obituary T.A. Ross. British Medical Journal, 1, 463–464. Hurst, A.F. (1949). A twentieth century physician, being the reminiscences of Sir Arthur Hurst. London: Edward Arnold. Hurst, A.F. & Symns, J.L.M. (1918). The rapid cure of hysterical symptoms in soldiers. Lancet, 2, 139–141. Jones, E. & Wessely, S. (2005). War syndromes: The impact of culture on medically unexplained symptoms. Medical History, 49, 55–78. Jones, E. (2012). War Neuroses and Arthur Hurst. Journal of the History of Medicine and Allied Sciences, 67(3), 345–373. London, W.S. (1919). Seale Hayne Military Hospital, the wonders of neurology. War Pensions Gazette, 27, 335–336. Lumsden, T. (1918). Treatment of war neuroses. Lancet, 2, 219. Mott, F.W. (1918). War psycho-neurosis (I). Neurasthenia. Lancet, 1, 127–129. Ross, T.A. (1944). Anxiety neuroses of war. In A.F. Hurst (Ed.) Medical diseases of war (pp.149–174). London: Edward Arnold. Tippet, J.A. (1939). Psychological casualties in war. British Medical Journal, 2, 742. Shephard, B. (2000). A war of nerves. London: Jonathan Cape. Wright, M.B. (1939). Treatment of psychological casualties during war. British Medical Journal, 2, 615–617.